A small embroidered patch of the Canadian flag measuring 3x2 inches. 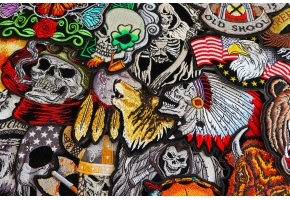 Fully embroidered surface patch can be sewn or ironed on. Features red borders all around. The Canada flag is for all patriotic Canadians. 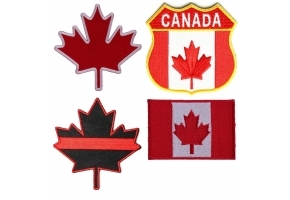 If you are an American with Canadian heritage I can also recommend the USA Canada flag patch where both flags are embroidered on one patch with yellow borders. Are you from the amazing country of Canada? There are many bikers from this northern country, even though you might think there would be more snowmobile drivers. It's true that much of the country is snow and ice, but there are also many areas that have warm weather during the summer months, and bikers take to the streets. They travel across the whole of Canada and down into the United States. 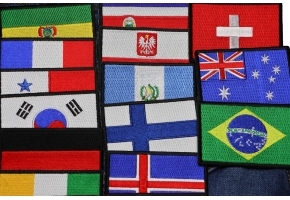 If you're from Canada, you'll want to show your pride by wearing a Canada Flag Patch on your jacket. This patch is a perfect replica of the Canadian Flag. 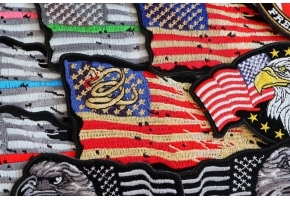 It's under the Flag Patches and is one of many in stock patches you'll find on The Cheap Place. The Canadian Flag is easily recognizable by its large red three-branched maple leaf in the center flanked by red stripes on either side. The flag is also called the Maple Leaf, and it was first adopted as the official Flag of Canada in 1965. Prior to that, the Union Flag of the United Kingdom was flown as the official flag. The Maple Leaf was designed by George F. G. Stanley and John Matheson and was based on the official flag of the Royal Military College of Canada. Following the introduction of this flag, many of the flags for various other offices, government bodies, and military forces have incorporated the maple leaf, and it has become the symbol of Canada. The Union Flag and the Maple Leaf are actually both listed as the official flags of Canada, and the Union Flag is used as Canada's symbol in the Commonwealth of Nations. This patch version of the Canadian Flag measures three by two.